One thing we love all year round is a good crab cake. You'll find hundreds of recipes for crab cakes on line. One of the most famous recipes of all is the Old Bay crab cake recipe which is found right on the can. There are lots of recipes that include diced peppers, celery, onions and lots of other ingredients. 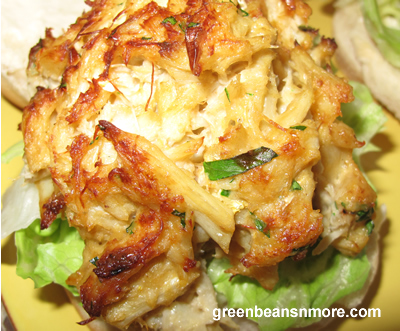 If you're using a recipe with a lot of add-in's don't waste your money buying lump crab meat. The perfect crab cake recipe consists of sweet lump crab meat with just enough added to hold it together and give it a bit of flavor. Flavorful and sweet lump crab meat should always shine through. That's why we like this recipe from Jimmy Cantler's Riverside Inn in Annapolis Maryland so much. It's actually more like a crab imperial. Several years ago I did a blind taste testing with my husband. I made this crab cake following Jimmy Cantler's recipe, and the one from the Old Bay container. He preferred this one. In a large bowl, combine the egg yolk, salt, pepper, mustard, Worcestershire sauce, mayonnaise and parsley. Then, gently fold in the crab meat (be careful not to break up the lumps). Shape into cakes and broil for 5 minutes. Cooks tips: This particular recipe is more like a crab imperial. I form the crab cakes on a piece of aluminum foil on the baking sheet and then place them in the refrigerator for at least 20 minutes before cooking. You may want to add a second egg yolk or a bit more mayo to help the crab cakes stay together. The original recipe calls for 1 and 1 /2 teaspoons of salt. I changed it to 1/2 teaspoon. When I've added 1 1/2 teaspoons the crab cakes were inedible. Be aware that some brands of crab meat are EXTREMELY salty. You may want to sample the crab meat before you add salt to the mixture. I sometimes use a mix of 1/2 pound of jumbo and 1/2 pound of backfin crabmeat. What to serve with crab cakes? Our Green Beans a'la Watermans are the perfect side dish for crab cakes!